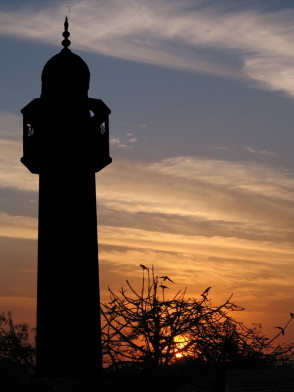 Minaret at dusk (picture by Danishkha, via iStockPhotos). New Delhi, June 18 (IANS) — “There are nearly 600 mosques all over the country, 53 in Delhi alone, where Muslims cannot pray because they are seen as historical monuments,” said Intezar Naeem of the Jamaat-e-Islami Hind, a body founded in 1941. “Imagine how you would feel if reasons of history were given to prevent you from praying in equally ancient (Hindu) temples?” he asked. The 53 mosques in the Indian capital include those located inside the 17th century Red Fort, one across the road near Jama Masjid, in the Safdarjung Tomb, in Lodi Garden and at the imposing Qutub Minar complex (Quwwat-ul-Islam). The Khairul Manazil mosque opposite the Old Fort is also out of bounds for prayers. So are the ones inside the Delhi Golf Club grounds and near Wazirabad bridge, near the Yamuna river. Similar restrictions are in place at the mosque near the Ferozeshah Kotla ground here. Nevertheless, on major Islamic holidays, Muslims pray there in large numbers. But once the prayers get over, the police slap cases against the prayer leaders accusing them of intruding into protected monuments. According to Naeem, all the nearly 600 mosques were built during the Mughal era and are 500 to 250 years old. “The ASI says these are historical mosques and they need to be preserved as part of history,” Naeem told IANS. “Our stand is that mosques are not built for any historical reasons. They are built so that Muslims can pray. What will happen if the Makkah is disallowed for prayers because it is a historical mosque? The issue of being denied permission to offer prayers in historical mosques has repeatedly brought Muslims into conflict with the authorities here. In the 1980s, Muslims in the Indian capital took to the streets saying they should be permitted to pray at the mosque near the main gate of Safdarjung Tomb, a huge 18th century monument near Lodi Garden. The deadlock continues to this day although prayers are now allowed on Fridays. Recently, Abdul Haq Ansari, the head of the Jamaat-e-Islami Hind, urged the Indian government to throw open the gates of all historical mosques to Muslims. Shoaib Iqbal, deputy speaker of the Delhi legislative assembly, made the same demand when he called on Prime Minister Manmohan Singh to discuss a variety of issues. ASI officials admit they don’t have the resources to protect or preserve all the mosques in their custody. But some ask why should Muslims insist on praying in these monuments when there are tens of thousands of mosques in the country. “The reason is simple,” replies Naeem. “A mosque is meant for our community, not for tourists. If you don’t agree, where is the freedom of religion? “How will you feel if the government does not allow you to pray at a temple just because it is hundreds of years old? “Worse, while we Muslims cannot pray at these mosques, all kinds of people enter them, wearing shoes and slippers. Some outlying mosques (here) have become dens. But when Muslims go to pray, they are chased away.